The name Audi spells out class and sophistication. With a wedding symbolising the union of two souls, what better way to celebrate it than by renting out the very best name in the realm of automobiles. 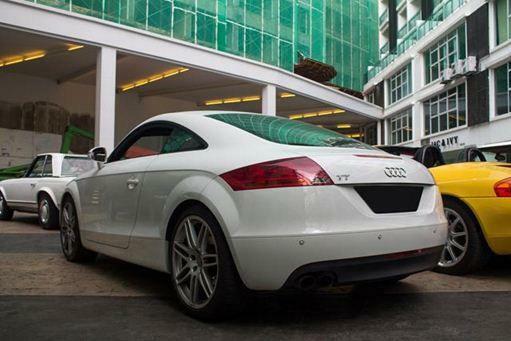 Audi cars, with their iconic beauty are the stuff of dreams for most auto enthusiasts. Since they are quite costly, you can opt for a cheaper version with our Audi Wedding Car Rental which provides the same comfort of the Audi at only a fraction of the price. The name Audi came into existence only in 1910 whereas the company has been producing automobiles from as early as 1885. The first automobile of the company, called the Audi Type A was produced in 1910 and was followed by a Type B in the same year itself. The first cars were a whopping 2,612cc and 3,564cc models and were vastly popular in the sporting events as well. Later, after the World War II, the cars were renamed from the pre-war models to the IFA F8 and F9 and came under the same general umbrella as the other automobile giant company, Volkswagen. Some of the most popular Audi designs that can be found at our website such as the Audi A6 Hybrid, Audi A4, Audi R8 and Audi A8 have been stated below along with their features and their benefits as wedding cars. With spacious interiors that are guaranteed to make her feel like a princess, this is one sweet beauty. The Audi A8 has a 3.0 litre V6 engine that gives an astonishing 333 hp and 328 lb torque. The ride is smooth as a pillow thanks to the full air suspension and the presence of a sunroof guarantees a number of picturesque moments. This car can provide the much needed relaxation aftr the stress of a wedding. The ideal car to cater to the requirements of a bridal party: The car has to accommodate the bride and all her bridesmaids and the RS6 is fully equipped for that with the 5 door setup of the model. The car features a gorgeous seed of 0-100 in 4.6 seconds flat and has a 4.2 L V8 40v DOHC ‘biturbo’ engine that has a 5 speed ZG 5HP24A tiptronic automatic transmission. The car has a beautiful design that appeals to all car enthusiasts and is one of the most sought after cars in the Audi line. Finally, A3, one of the most popular cars in the line: With a 1968 cc Diesel engine providing 143hp at 3500 rpm, it is a fast and efficient car. The car’s luxurious looks and classy appeal makes it the perfect car for your wedding with the added benefit of the spacious interiors. Audis need no introduction. With the name practically on the wish list of every car enthusiast, it is one of the most premium automobiles brand in the world. Make your wedding special with by renting an Audi from us and give her the ride of her life.